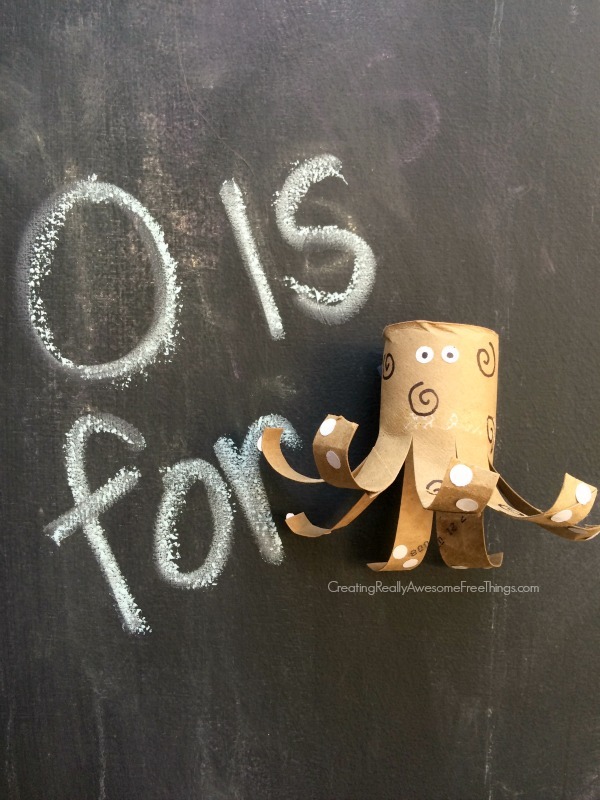 Octopus: Toilet paper tube crafts - C.R.A.F.T. First, cut 8 slits about 3/4 the way up the toilet paper roll tube. These will form the tentacles! Then, use a hole punch to punch out 20-ish white dots from any scrap paper and glue them to the underside of the tentacles. You will also use 2 hole punches as eyes. Use a black marker to draw swirls and add pupils to the eyes. The last thing you need to do is curl the legs up with a pencil or any other small cylinder shaped object you have laying around, pen, chop stick, etc! Crab, shrimp, and lobsters are octopuses favorite foods! When threatened, octopuses shoot an inky fluid that darkens the water to confuse the attacker. Octopuses typically live alone in dens built from rocks. Next Tuesday I’ll have a letter P toilet paper tube creature ready for you! Can you guess what P animal I made!? i cannot tell you how obsessed i am with reusing anything i can…other toilet paper roll crafts have been done over and over…i love that these are original. Well done mama. well done.